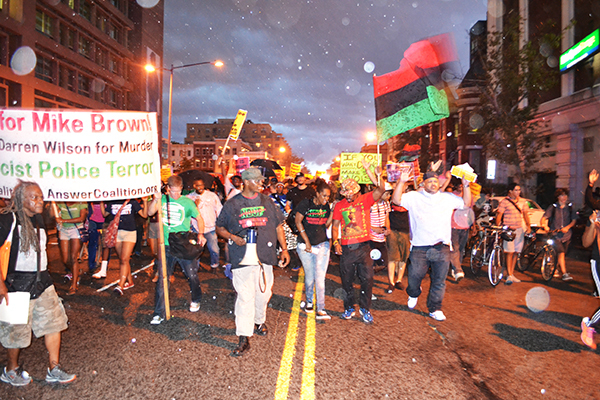 A thunderstorm producing strong winds and heavy rain didn't stop protestors from marching down U Street on Saturday evening. Starting at the African American Civil War Memorial, the protestors stopped at multiple intersections, often blocking traffic. The march was part of a series of protests that began after Michael Brown's death in Ferguson, Mo. last month. A thunderstorm producing strong winds and heavy rain didn’t stop protestors from marching down U Street on Saturday evening. Starting at the African American Civil War Memorial, the protestors stopped at multiple intersections, often blocking traffic. The march was part of a series of protests that began after Michael Brown’s death in Ferguson, Mo. last month.